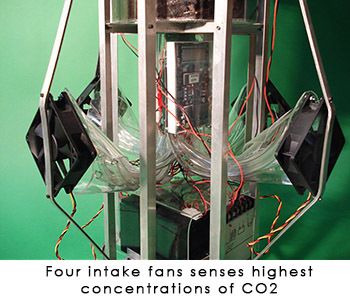 The CO2 roamer is part of a series of works that upgrade natural organisms with man-made technology. In this project, I attempt to help a bamboo plant by giving it the ability to find high concentrations of CO2. More poetic than practical, the project will help highlight the intersection of technology with the plant world and create a dialogue about our responsibility in protecting our natural resources. In addition, I am trying to emphasize both the incredible speed at which technology can destroy nature and the potentially crucial role technology may play in preventing the final obliteration of our natural world. The speed of technology could be used to help nature recoup lost ground. Although my intent is to help the plant, the reality is that the project simultaneously helps the viewer by increasing oxygen as well…even if the viewer is not interested. This can be seen as analogous to our society where the protection of our natural resources will benefit even the worst environmental offenders.